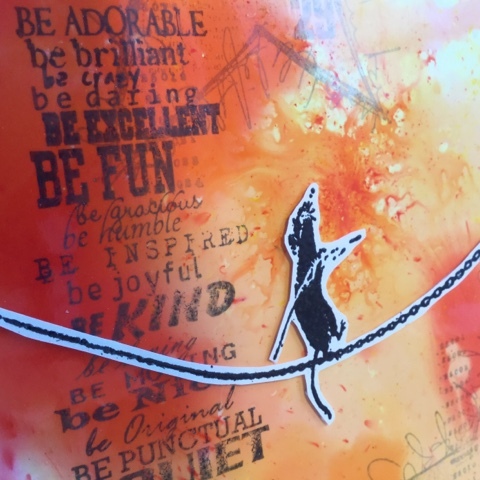 I just love this little Banksy rat balancing on a chain. I heat embossed him with black embossing ink, continued the line of the chain first with a black marker, then with an embossing pen and embossing powder. A touch of fussy cutting, and my focal point was ready. It has been mounted on thin strips of foam tape. 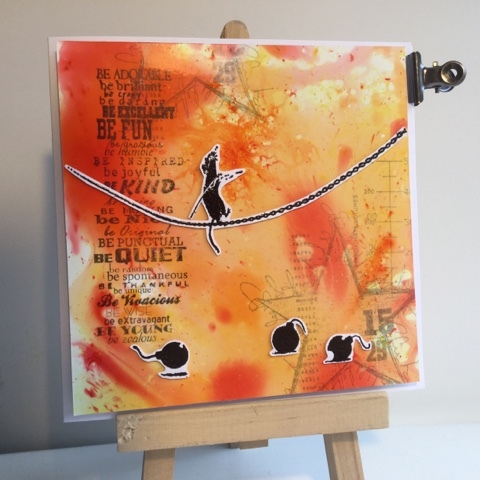 The background is from last summer: Brusho colours dripped and dropped on ink jet photo paper. Love the effect! I stamped the background with stamps from VivaLasVegaStamps and Archival inks in black and grey. This is great ! Thank you so much for joining us over at Country View Challenges ! And it is still great ! Thanks for joining us over at VLVS! too !